It was found that 308 nm ultraviolet light could promote the apoptosis of T cells activated in the skin lesions of vitiligo. 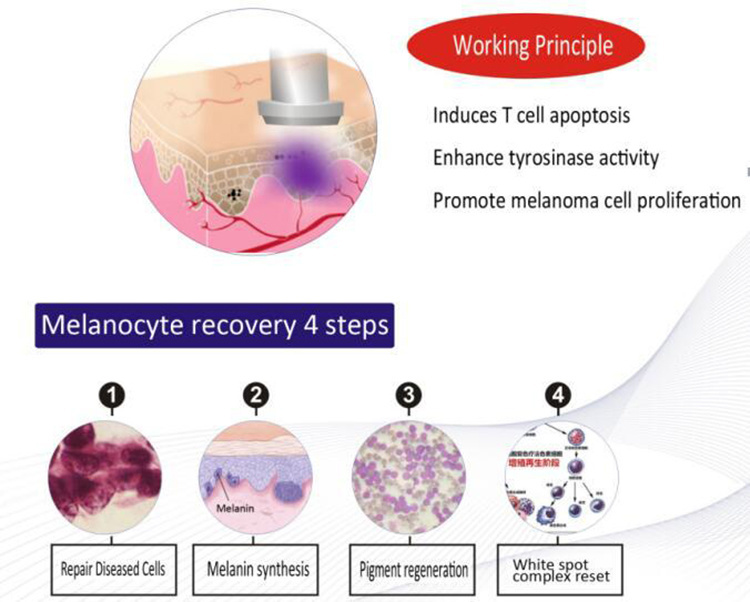 After irradiation, T cells can undergo apoptosis and the skin damage will not only disappear completely at the visual level, but also return to normal tissue structure at the microscopic level. Vitiligo is characterized by selective destruction of melanin cells and may be associated with autoimmune responses. 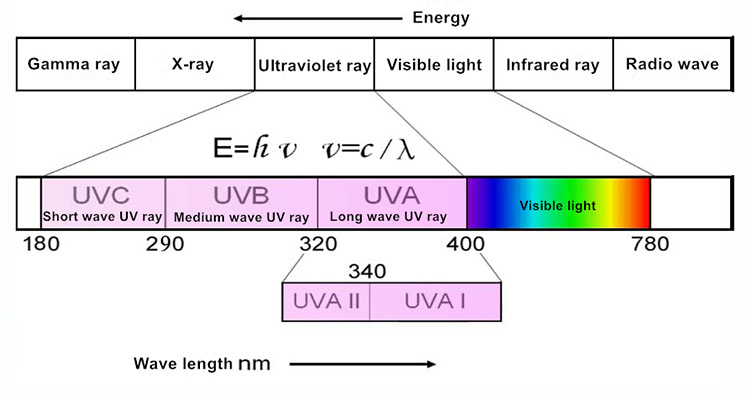 Recent studies have shown that various cytokines and inflammatory mediators increase after exposure to UVB irradiation, suggesting that UVB induces pigment recovery. 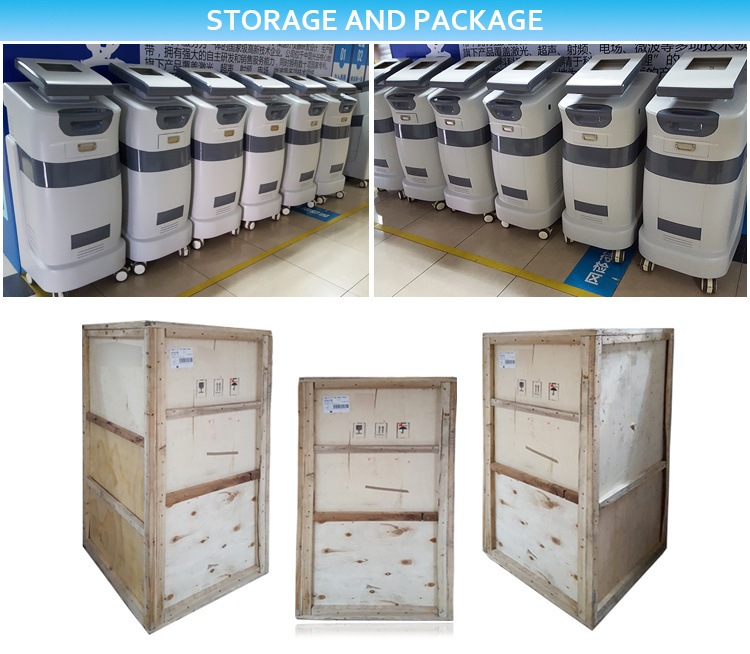 The ultraviolet ray at 365nm±6nm has the function of enhancing cellular immunity, which can be used to prepare cells for premature apoptosis caused by ultraviolet rays, improve metabolism, epithelial regeneration and sterilization, etc. It is mainly for skin lesions. The 308nm laser light beam acts directly on the dermal layer of the leukoplakia to induce apoptosis of T lymphocytes for therapeutic purposes. The 308nm laser solves the problem of melanocyte destruction from the roots, stimulates the proliferation of residual melanocytes, promotes the production of vitamin D3, and provides a good environment for the growth of melanin. 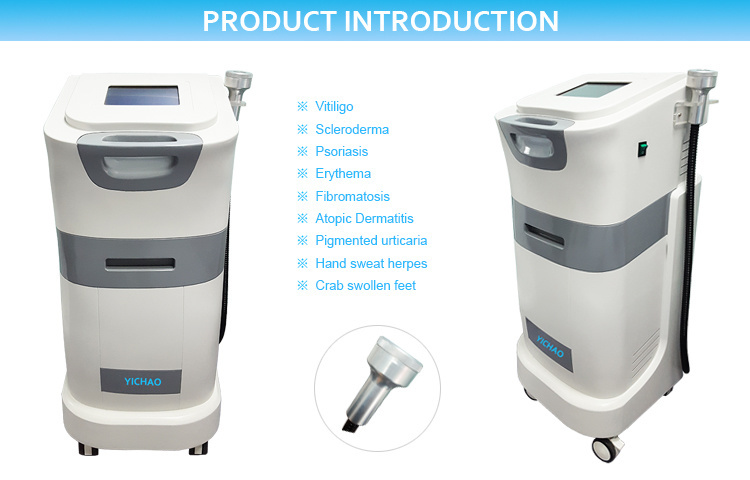 For patients with leukoplakia who are not suitable for melanin cultivation and are not suitable for drugs, leukoplakia for pregnant women and leukoplakia for children, the 308nm laser therapy instrument is the first choice. 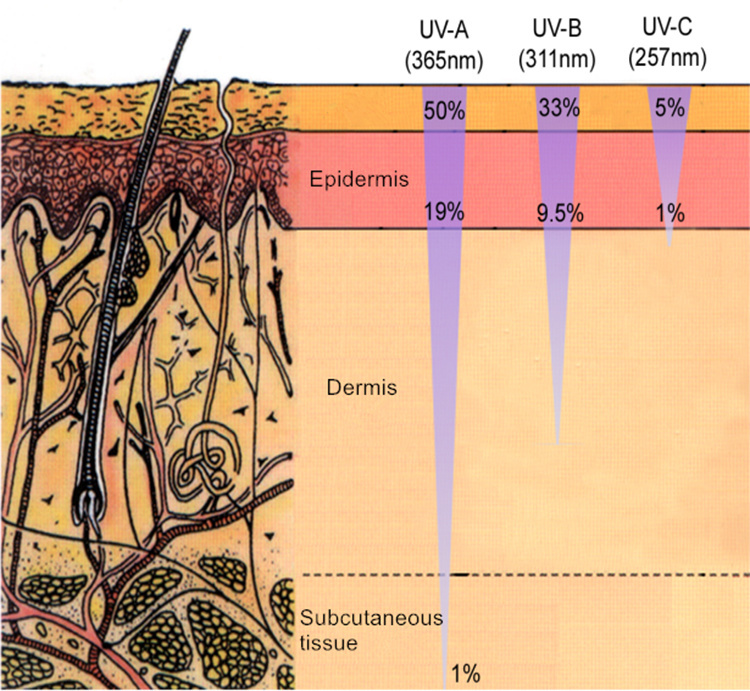 The penetration depth of UV rays to the skin is related to the wavelength. 1) Semiconductor Crystal Lighting Technology,Single light source.There is no possible drift due to the luminescent medium being a gas,High irradiation intensity. 2) Electro-optical conversion rate is high.The energy consumption of the equipment is relatively low.Can start treatment at any time.Long service life. 3) Zero consumables:There is no need to change lamps or gas tanks.Annual savings of tens of thousands of replacement lamps and gas tanks.The right investment saves money. 4) Safe use, anhydrous silver, no chlorine release, no toxic side effects,Suitable for delicate skin,Pregnant women and children can use. 5) Significant effect, a single light source to avoid infringement of invalid light, improve skin resistance of the patient site up to 5 times, so that the efficacy is five times the gas light source. 6) Separate 308nm lasers do not require adjuvants or other drugs.Can quickly remove intractable psoriasis and vitiligo. 7) Handle therapy can be adjusted according to the area and shape of the lesion site, only to the lesion site, without damaging the surrounding healthy skin. 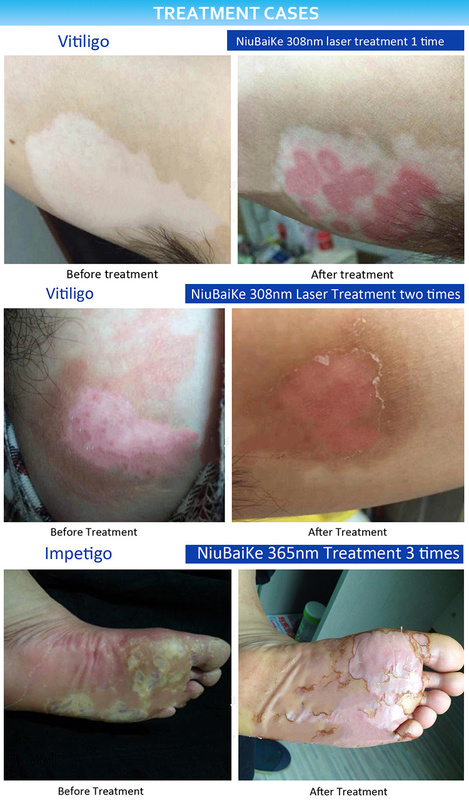 8) The platform can be combined with a unique 365nm solid-state laser,Provide more treatments for vitiligo psoriasis.Better combination therapy. 1) Immune related skin diseases: Scleroderma, psoriasis, genital sclerosis, atrophic moss, lichen planus, systemic lupus erythematosus, generalized chronic eczema, atopic dermatitis, polymorphous light eruption, pigmentary urticaria, hand Sweat herpes, presacral myxedema (thyroid dysfunction), allergic dermatitis. 2) Proliferative skin diseases: hypertrophic scars, keloids, swollen crabs, neurofibromas, spastic granulomas, T-cell lymphomas. Scleroderma (limitation): It is an autoimmune diffuse connective tissue disease, a large number of collagen deposition in the subcutaneous tissue. Pityriasis rosea: It is an autoimmune disease with a mother plaque in the beginning and a wide distribution of subsequent spots. It has certain seasonal, self-limited and rarely recurring features. Mycosis granuloma: It is a type of epithelial cutaneous lymphoma. It is characterized by the proliferation of helper T cells, with various forms of erythema and invasive lesions in the early stages, and subsequent development into tumors.